I offered no compensation for taking the survey - THANK YOU AUTHORS for donating your time! 1) Cumulative years of pursuing writing as a career before first book sold? 2) What type of house published your debut book? More than half of the young adult authors participating in the survey were published by Big Five publishers. I asked authors to rate their experience with their publisher on a scale from 1 (terrible) to 10 (amazing). Authors at larger and smaller houses reported about the same satisfaction as long as the publisher offered an advance. Authors at houses without advances reported a slightly lower average experience. As for marketing assistance, authors at large houses reported slightly more marketing assistance than authors at smaller houses. Did this translate into sales? I sliced the data a few different ways to see if a few runaway bestsellers were skewing the results (I checked the median and mode, too). The average for large houses is about 20,000 copies no matter how you look at it. The average for small houses is always about half of that. 3) How many drafts did you write of your debut book before it was accepted for publication? Half of young adult writers wrote four or more drafts of their story before it was accepted for publication. 4) How many hours a week do you devote to writing? Almost 40% of published young adult writers don't have a regular writing routine. Most of the authors without a regular writing schedule were published by a Big 5 Publisher (75%). A writer doesn't need a set schedule to be published by a major house, although it doesn't hurt. Most of those working 40+ hours per week were also published by a major house (75%). 5) How many publisher rejections did you receive before your debut sold? Before you shake a jealous fist at those lucky dogs with no publisher rejections, consider this: all of those authors except one have sold only one book. Their careers sometimes stall after that first book. EVERY AUTHOR EXPERIENCES REJECTION in one way or another. Also, these numbers don't include agent rejections. One author with no publisher rejections was rejected by agents more than 500 times before selling that debut. Perhaps not coincidentally, he/she is the only one in this set who has gone on to sell books after his/her debut. It pays to have grit. More on agents later, for now let's look at how many novels a typical young adult author writes before selling something. 6) The average young adult author writes 3.4 "practice stories" before selling one. In other words, young adult authors write 4.4 stories (including their sell) on average before their debut payday. 7) So how much is the typical young adult author advance? The average (mean) young adult advance is $38,000. However, this lumps together those with no advance and those making $100,000+. Here are the advance spreads by large and small houses. The data is clearly a bit patchy. With more data, we'd probably start seeing some nice bell curves. However, according to this data, the most common young adult advance at a smaller house is between $1,000 and $4,999. The most common advance size at a Big 5 publishers is $10,000 to $19,000, with advances going all the way up to $150,000. Note, all of the advances in the $150,000+ range were titles pitched as series. The highest advance in the survey was over half a million dollars for a three book series. Wow, some of those advances are HUGE! So what did authors actually earn last year? 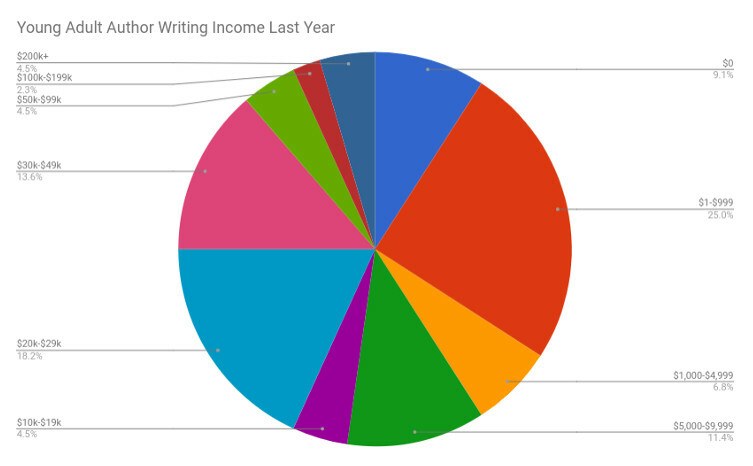 8) What was your total writing income last year? 50% of published young adult authors made less than $10,000 last year. Only the top 11% made $50,000 or more. Wait! Why are most authors earning less than the average advance? Well, most young adult authors in the survey didn't sell a book last year, and authors don't earn royalties until their books sell enough copies to cover the advance. At least 20% of book never "earn out," and it takes some book several years to earn out. Authors don't earn anything in the meantime. Some authors only sell one book, while authors with multi-book deals don't receive their offer all at once. Advances for series usually come in chunks over several years at books are accepted for publication. What helps increase and authors annual income? Having an agent! The average income for a published young adult author with an agent was $31,000. The average income for one without was $5,000. Selling a book in that calendar year. The highest earning author said his/her income was 90% advances, 5% royalties, and 5% misc. Note, this author sold 150,000 copies of his/her debut book and has sold 13 trade book titles over a career; however, royalties still only made up a fraction of his/her income. Don't count on royalties to support you. Write something new! 9) What is the typical word count for a young adult novel? The responses varied from 25,000 to 150,000 words. The average (mean) word count was about 73,000 words. Most young adult novels fall between 50,000 and 80,000 words. 10) Was your debut young adult novel pitched as a series? Most debut young adult novels are not pitched as a series. I asked the authors if their books went on to become series. 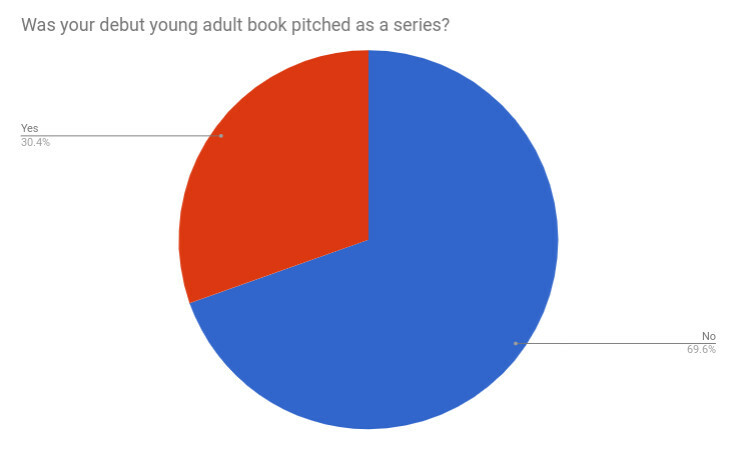 All of the authors with books pitched as series went on to become one, and twenty-percent of the titles not pitched as a series also transitioned into series. However, overall most young adult novels are stand-alone titles. 11) Do you write in more than one genre? Most young adult authors (79%) write in more than one genre. 12) Was your young adult debut published with the help of an agent? 73% of young adult novels debuts were published with the help of an agent. This is about the same percent as middle grade novels, but significantly higher than picture book debuts where only about 50% were published with the help of an agent. I asked the writers if they are currently represented. The percent of representation increased to 76%. Half of the young adult writers who sold their debut without an agent are now represented, and 12% of those with representation for their debut are now without an agent. This leads into our next question about agent turnover. 13) How many agents have you had over the course of your career? Most young adult authors (62%) have had one agent, although about a quarter have had two or more agents. It's somewhat common for a young adult author to shift agents mid-career. 14) How many rejections did you collect before signing with your first agent? Twenty-five percent of published young adult authors are rejected over 100 times before signing with an agent. I asked a handful of agents what percent of queries they take on as new clients. Most of the agents take on less than 1% of all queries as clients. If you've been querying agents and receiving A LOT of rejections, you are in good company. It's a tough market, but don't let rejections get you down. Use them as information to improve. Writers signing with an agent after 30 rejections wrote more drafts of their debut story than those that sold more quickly (4.7 drafts vs 3.1 drafts). They also wrote more stories: 5.5 stories before selling their debut novel vs 2.4 stories for those with fewer rejections. If you've sent your novel to more than 30 agents and haven't had any requests, consider a seeking more feedback and revising before sending it to additional agents. In other words, if at first you don't succeed, write and write again. This is why it's so important for an agent to be passionate about a project before they take on additional clients. It can take a lot of energy (and time!) to sell a book. As for those stories with zero publisher rejections, about half of those were stories where the author came to the agent with an offer in hand. The agent just came on board to negotiate the deal. 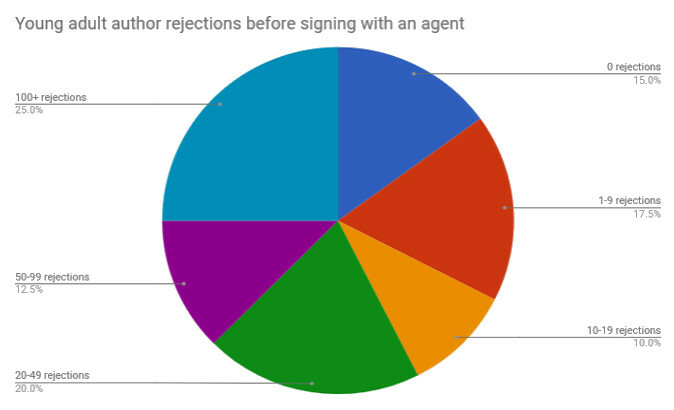 Most stories on agent submission recieve at least a handful of rejections. 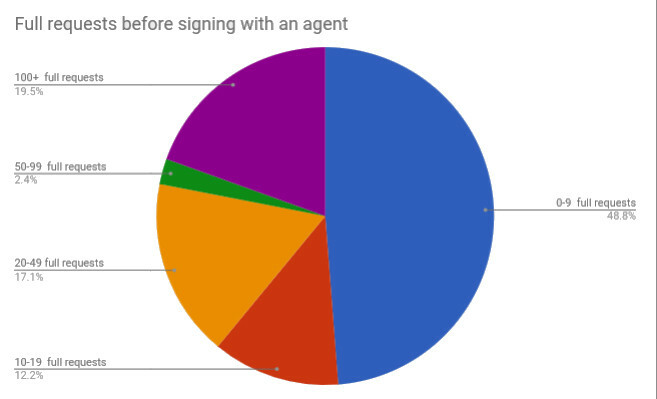 15) How many full requests did you receive before signing with you agent? Half of young adult authors received ten or more full requests before signing with an agent. Twenty-percent received 100 or more full requests. Note, these requests were probably not all for the same story. Remember, the average young adult author writes more than four novels before selling something. I also asked authors how often they received personalized feedback from full requests. Authors hear back with specific feedback on less than half of full requests (44%) on average. A full request is a great sign your story is on the right track, but don't be surprised if it doesn't result in a lot of individualized feedback. 16) How long after signing with an agent did it take to sell your first story together? A third of authors sell their first story more than six months after signing with an agent. 17) If represented by an agent, how many different stories did your agent send on submission last year? 20% of young adult authors had multiple stories out on submission last year. However, most of these authors write in multiple genres and some different age categories. These weren't all necessartily young adult submissions. 18) If represented by an agent, how many stories did you sell last year? Most young adult authors didn't sell a story last year; however, that's partly because 30% weren't on submission at all. Of the authors on submission, about half sold at least one story. These numbers are more illuminating than the results of question 16. In question 16, we already know the debut book sold (or they wouldn't be taking the survey). However, in this question it's just: did you sell something last year? According to this question, you have a 57% chance of selling a YA novel over 12 months on submission with an agent...and that's if you've already sold something. It'd also be interesting to know what percent of clients on agent lists have never sold a book. 19) On a scale of 1 (terrible) to 10 (excellent), how much do you like working with your agent? Most authors really like working with their agent. Only 12.5% of authors rated their agent lower than a 5. She is always in my corner! I'm crazy lucky. He's not only a great agent, but a great friend as well. 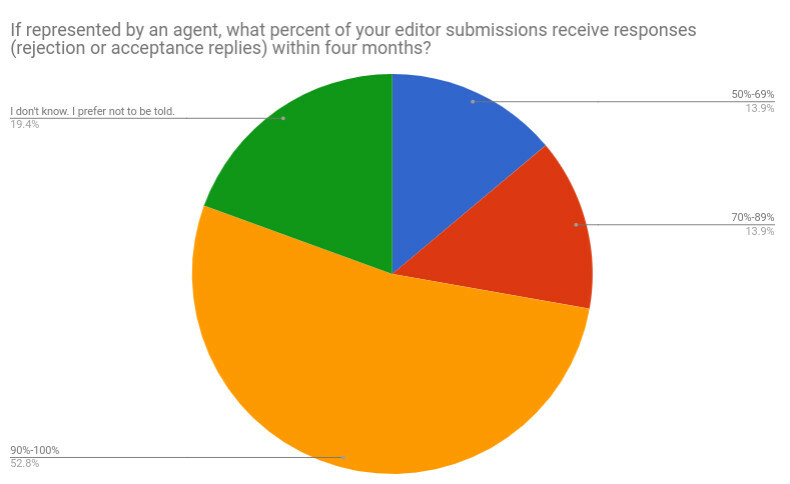 20) If represented by an agent, what percent of your editor submissions receive responses (rejection or acceptance replies) within four months? Most agents hear back from 90% or more of their young adult submissions by the four-month mark. Everyone in this survey heard back from at least half of the editors within four months, although some authors prefer not to be told their submission lists. All of the authors in the survey who wanted a submission list were supplied with one. It's unusual for an agent to withhold a submission list against the author's wishes. 21) If represented by an agent, how many editors did your agent submit to on your most recent round of submitting? 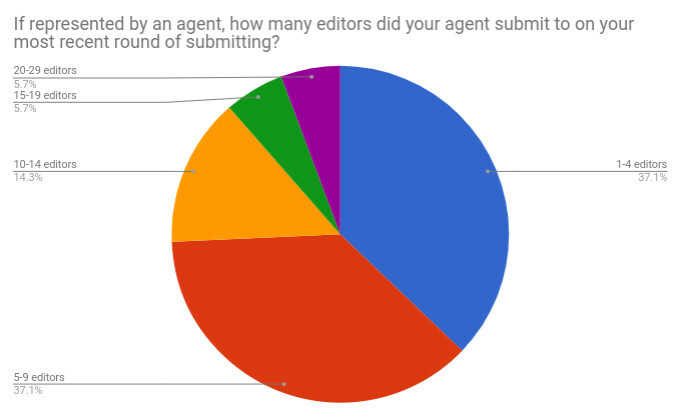 Most agents submitted to less than ten editors on their most recent round of submitting. 22) If represented by an agent, what types of houses did they submit to on your most recent round of submitting? The majority of agented young adult submissions went to Big Five publishers. According to this survey, no agents submitted exclusively to small houses. 23) How many trade children's book have you sold (with or without an agent) over the course of your career? Most of the authors in the survey have sold three or fewer books, although one outlier (not pictured below for scale) has sold more than 30 books. The person selling the most books has been working for more than ten years. Book sales generally increased with years in the industry. However, this isn't guaranteed. Twenty percent of multi-published young adult authors were not represented. However, all of the authors selling ten or more books had agents. That said, there isn't a clear correlation between books sold and annual income. An author with three books published won't necessarily earn more money in a year than an author with only one book. With all these surveys, please remember that data can provide a good overview, but numbers do not define you or your work. No matter where you are in your creative journey or where life takes you, your work is worth creating! And YOU are worthy of the work. All the best and happy writing trails!! !